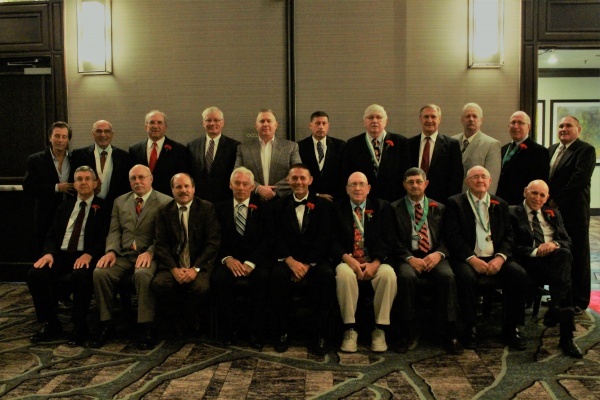 The New Jersey Chapter of the National Wrestling Hall of Fame became a reality with the induction of the Class of 2001. We thank the founders of the New Jersey Chapter: Frank Mosier, John Harmon & Barry Burtnett. The Inductees are in three separate classifications: Lifetime Service to Wrestling, Outstanding American, and State Medal of Courage. All Inductees are honored at the Annual Award Banquet and have a plaque in their honor in the National Hall of Fame in Stillwater,Oklahoma. Welcome to the web site of the New Jersey Chapter of the National Wrestling Hall of Fame. We are pleased that you are interested in viewing the information we have developed which informs you about the activities our Chapter has been engaged in during the past several months. We hope that the information provided best describes some of the work our membership has been committed to doing for the advancement of wrestling especially in the State of New Jersey. Through this web site, we look forward in providing timely messages, information about previous sponsored events, as well as conversation about wrestling, and what activities the New Jersey Chapter has planned and designed in the weeks and months that follow. Take the time to read, enjoy, and most importantly, become involved through our web site in continuing to make our sport the great one that it is in the State of New Jersey, and beyond. Our 16th Annual Golf Tournament will take place on the above date, and again at Mercer Oaks Golf Course in West Windsor, Mercer County, N.J….